When it comes time to carry out mixing projects for solidification, stabilization and environmental remediation you will need reliable equipment built with durability in mind. Regardless of the scale of the job, Alpine has soil mixing attachments to fit the bill. Here at Alpine, we are completely devoted to providing our customers with excavator-based soil mixers they need to get their next project done as quickly and cost-effectively as possible. If you are searching for soil mixing equipment that will fit your budget and has been created from the ground up with a focus on the smallest of details, contact Alpine today. Compared to other options, in-situ remediation of contaminated soil or treatment of waste materials (e.g. 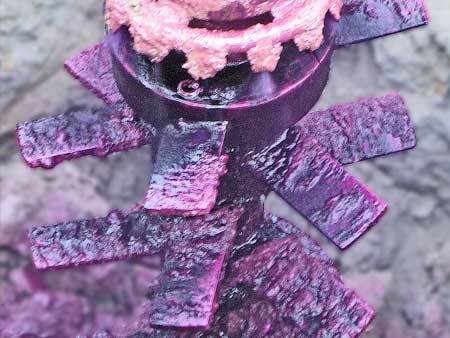 sludge, dredged material, or drilling mud) is the most cost-effective. Exorbitant disposal costs are removed from the equation when material does not need to be handled or transported off site. Moreover, Alpine’s equipment is suitable for use on standard excavators which eliminates the need for special carriers with high mobilization costs. Our equipment only requires the excavator or carrier to have auxiliary hydraulics plumbed to the end of stick- same as that required by hammers, grapples or other mechanized attachments. We are proud to be able to offer our customers the largest selection of sludge and soil mixing attachments in the world. This begins with our transverse soil mixers that can be utilized with carriers of nearly any size. These transverse soil mixers can be operated with compact minis or machines up to 100 tons. They also have a number of features that operators have come to rely on including depth limiters, extension brackets, and quick hitch buckets. With a range of mixing blade sizes and configurations, we can customize the mixer to give you optimum results. Our mixers are designed using 3D models of both the mixer and the substrate. This ensures homogeneous blending of the additive with the substrate. All our mixers can be equipped with injection nozzles or pipes to allow injection of additives to the working drums. This provides for complete incorporation of the additive and excellent conditions for the chemical or biological reactions. Our customers have found that achieving a uniform blend reduces the additive requirements. For example, one customer solidifying drill cuttings in the natural gas industry was able to reduce quicklime requirements by 300% while achieving the same results. Thus, they realized significant savings for the project owner. In addition to our transverse soil mixing attachments, we also have some of the industry’s most trusted axial mixers and double header mixers. The Alpine axial and double header mixers are built with a unique modular design that allows operators to carry out any number of tasks, including operations in liquids, sludges, slurries and soil. We also offer high-end pressure feeders and mixers that can be used as an integrated system or a single component for your next soil mixing project. We began Alpine with one simple belief: that it is our responsibility to put the right tools into the hands of customers that need them. This is why we are proud to offer some of the industry’s leading machines that will handle jobs of all sizes. Take a look at our full line of mixers, roadheader attachment equipment, concrete grinders, and more.